Enjoy the history, lore and culture of the North Shore, with Great Food and Fun! One of the Best Tours in Hawaii! Luxury Air-Conditioned Hotel Pickups in Waikiki in our Gorgeous Air-Conditioned MERCEDES tour van. This Top-Notch tour will showcase scenic wonders, TWO DIFFERENT SIT-DOWN LUNCHES, all of it amazing (genuine Hawaiian food, Garlic Shrimp plate, decadent and rich Dessert, & more! ), with gorgeous photo opportunities to make your friends & family back home ultra-jealous! You’ll even have time for a personal shopping break in a historic coffee and chocolate plantation! You’ll be seeing some beautiful and special locations, learning what makes the North Shore Up-Country area so unique. The Famous North Shore Food Tour® (TUESDAYS ONLY — 9am until about 3-4PM) includes ALL your Food and Fun, delves into the history, lore and culture of the North Shore, with delicious Food, Fun, and Scenic treats mixed in, as always. One of Best Tours in Hawaii - We are the Original Hawaii Food Tours - Now in our 15th year! This Top-Notch tour will showcase scenic wonders, TWO DIFFERENT SIT-DOWN LUNCHES, all of it amazing food (garlic shrimp, genuine Hawaiian food, roadside grinds, decadent and rich Dessert, & more! ), with gorgeous photo opportunities to make your friends & family back home ultra-jealous! You’ll even have time for a personal shopping break in a historic coffee, sugar, and chocolate plantation! 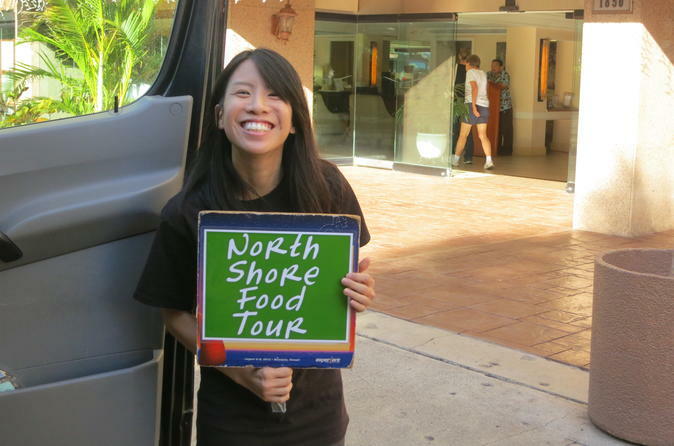 The North Shore Food Tour has the same friendly, intimate and exclusive feel as our other tours. But please do not expect to be back much before 4PM because traffic can be so unpredictable. *** Special Note: For VEGETARIANS, VEGANS & GLUTEN-FREE Guests: This tour is designed to showcase the foods of Hawaii and is not an a la carte type of setting, so please keep this in mind if you are a VEGETARIAN, VEGAN or GLUTEN-FREE person and decide to take our tour.